Proponents of family values preach respect for mothers, but expect those same mothers to simply endure abuse within their homes in silence - normalizing violence for generations to come. 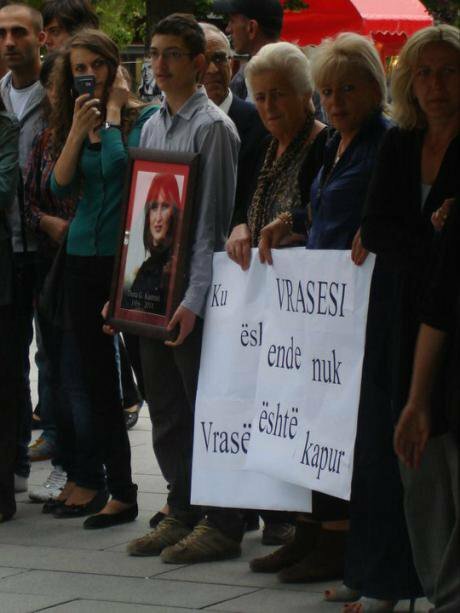 Five years ago, on May 18, 2011, a Kosovar woman named Diana Kastrati was shot dead in broad daylight as she walked to class at the University of Prishtina. Her ex-husband, Adnan Kastrati, is accused of murdering her. Three weeks before her death, she had requested an emergency restraining order from a judge. The judge failed to issue the order, despite a history of abuse and complaints that Kastrati’s ex-husband had been threatening her life. He has been on the run since her death. The judge who failed to respond to Diana Kastrati’s call for protection was suspended, but was reinstated in 2014. In October 2015, Zejnepe Bytyqi was stabbed to death in her home in Suhareka, a town in southwestern Kosovo. Her husband stands accused of murdering her. Her family said she had reported abuse from her husband to the police 16 times since 2002. According to Bytyqi’s family, her husband had been released from jail because he promised the authorities he wouldn’t abuse his wife again. This isn’t how the law works. Kosovo’s criminal code requires police officers to immediately open investigations in domestic violence cases, prosecutors are obliged to prosecute abusers, and abusers don’t get to escape punishment simply by saying “sorry.” Whether they want to or not, judges must respond when emergency restraining orders are requested. If Kosovo’s justice system had simply done its job, the lives of Diana Kastrati and Zejnepe Bytyqi might have been saved. "Domestic violence is an isolated problem." Sixty-eight percent of women and 56 percent of men say they have experienced domestic violence in their lifetime. Women respondents said they tended to experienced violence from their spouses and parents, while men experienced violence from their parents. Only 14 percent of all respondents knew someone who reported domestic violence to the police. In almost half of the reported cases reported, the respondents said the perpetrator received no punishment. "Poor, unemployed, rural families have problems with domestic violence, not employed urban families." The research actually finds no correlation between geographical location, education and employment with regards to domestic violence. So the stereotype of the thuggish, unemployed man beating his wife after a night of drinking turns out to be just that, a red herring designed to portray domestic violence as a problem only poor people experience. "Institutions should try to prevent families from breaking apart, that’s their job." Prosecutors and judges attempt to “reconcile” abusive men with their partners, the assumption being that children would not fare well separated from their fathers. Kosovo’s legislation clearly states that the priority in domestic violence cases is safety and the prevention of further violence. There is absolutely no legal injunction to keep families together, especially in cases of domestic violence. "Only men perpetuate domestic violence." It’s pretty clear that although men are the greatest perpetrators of domestic violence, both men and women in Kosovo are normalized to a certain level of violence at home. 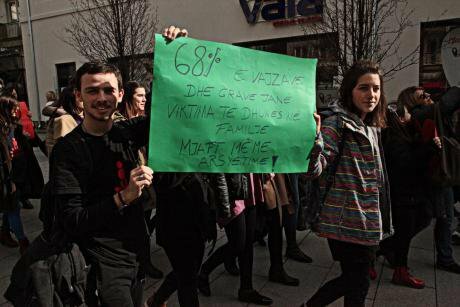 Although it happens less often, women in Kosovo can and do exercise violence towards their children, their daughters in law and their spouses, and men can also be victims of violence. There are currently no domestic violence shelters for men in Kosovo, although KWN’s survey shows that 56% of men have experienced some form of domestic violence in their lifetime. "LGBT people don’t need specialized domestic violence services." A high number of LGBT persons cite “home” as the most dangerous place for them. Reporting domestic violence in this scenario remains a challenge. In deeply homophobic Kosovo, one can imagine the amount of courage it takes to report domestic violence - or any crime - to the police as an LGBT person. This is why LGBT shelters for survivors of domestic violence must be an option, as well as speedy processing of such cases by the judiciary, which tends to act too slowly to deliver justice. "People experiencing domestic violence can leave if they really want to." The underlying assumption in this statement is that there’s a difference between “real” and “fake” abuse. There are endless reasons why someone may not be able to leave an abusive home. Particularly if you’re a woman in Kosovo (a country where only 1 in 10 women are employed), being economically dependent on the family breadwinner is a significant obstacle to leaving. If you have no means to support yourself or your children, deciding on abuse or poverty may be the only choices available to you.
" Domestic violence is just part of the culture, you can’t change it. " The officer’s statement, “We are ALBANIANS,” is code for “we are PATRIARCHAL and want to keep it that way,” and is an argument I’ve heard more than once to dismiss calls within Kosovo for greater gender equality. The excuse of “culture” is the same one repeated to explain why women and girls are sexually harassed, chronically underemployed, underrepresented politically and objectified constantly. Proponents of family values preach respect for mothers, but expect those same mothers to simply endure abuse within their homes in silence - giving abusers a free pass to become repeat offenders and normalizing violence for generations to come. Some parts of our culture are toxic, and they need to change to allow both men and women to live freely in Kosovo. The report was presented to the governmental working group responsible for drafting the new National Strategy and Action Plan against Domestic Violence, which is expected to be launched sometime this year. The governmental review of the previous national strategy is clear: prosecutors fail to raise indictments in domestic violence cases, and judges try - against all reason - to not separate abusers from their victims. 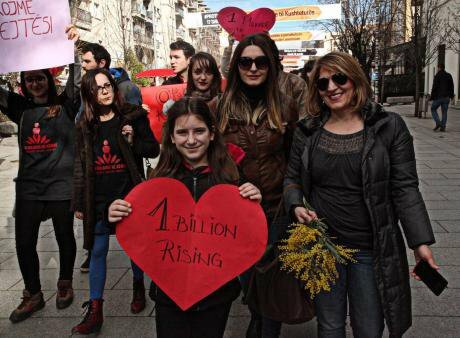 It’s high time for a system to be put in place that forces officials to actually do their job and stand up for Kosovo’s women.